Research indicates that if you’re seeking to maximize your rate of muscle growth, then there is a “best time to workout”… And in this article I’ll explain exactly what time that is. The time of day in which you train is something you’ve probably never taken into much consideration . Most of us simply train when our schedule best allows us to, which is perfectly fine. …but ALSO significantly accelerates the rate of muscle growth. And in this article, I’ll discuss exactly what time that is (and why), along with what to do if you’re unable to train at that time. But to start, let’s take a look at the research. Although studies regarding the optimal time to workout is limited, a few recent studies can help provide us with some insight. For example, this 2016 paper by Kuusma and colleagues compared the effectiveness of a training program performed in the morning versus the evening on 72 trained men. The researchers found that after 24 weeks, the evening training group experienced nearly 50% more muscle growth than the morning group. There was also a slight yet non-significant trend towards better strength improvements for the evening group as well. And although these results may initially seem out of the ordinary, they’ve actually been reproduced in multiple other studies. Subjects that trained in the evening experienced slightly greater muscle growth AND fat loss when compared to subjects that trained in the morning over a period of 10 weeks. So as you can see, based on the research it seems as though training in the late afternoon or evening seems to provide a slight edge in terms of muscle growth when compared to training in the morning. Most people are simply able to perform better and are naturally stronger in the evening when compared to the morning. Which is important since research shows that core temperature is highly correlated with exercise performance… And that typically, people are strongest and perform their best when their core body temperature reaches its peak. So since most people’s core body temperature is at its highest from around 3 – 9 p.m… This would theoretically be the best time to workout – and likely explains the results of the studies presented earlier. Don’t Change Your Gym Schedule Just Yet! However, before you make any changes to your gym schedule, there are a few other factors to consider. For example, if you work a physically demanding job then it’s likely best that you workout before your shift or during lunchtime as opposed to after since you’d likely be less fatigued. And there is some research in support of this. In addition, none of the research took into account that most gyms typically get notoriously crowded during evening hours. Meaning that you’re often waiting longer for equipment, have to change your exercise selection based on what’s available, and so on… Which in my opinion can very well negate the positive effects of training in the evening. Now if either of these two points do apply to you, or training in the morning just better suits your schedule, then there are a couple things you can do to ensure your performance is at least close to what it would be in the evening. 1) Ingest caffeine before your workout. One common yet effective strategy is to simply ingest caffeine before your morning workout. Research shows that this seems to help reverse the morning neuromuscular declines most people experience with morning workouts. Ingesting caffeine prior to a morning workout raises neuromuscular readiness and strength close to what it would be at during afternoon levels. Just be aware that caffeine tolerance might become an issue overtime and is something I’ll cover in a future article. 2) Make sure you’re adequately warmed up. Simply ensure that you’re adequately warmed up before your morning workout, or even perform a longer than usual warm up since there is a clear relationship between core body temperature and physical performance. This can be as simple as adding an extra 5-10 minutes of low intensity cardio to your warm up routine. The main goal here is to raise your core body temperature to at least close to what it typically would be at in the evening. 3) Be consistent with when you workout! And the last thing you can do is simply ensure that you’re being consistent with your workout time. Your body’s circadian rhythm adapts to slightly reduce the performance decrements you’d typically experience in the morning. 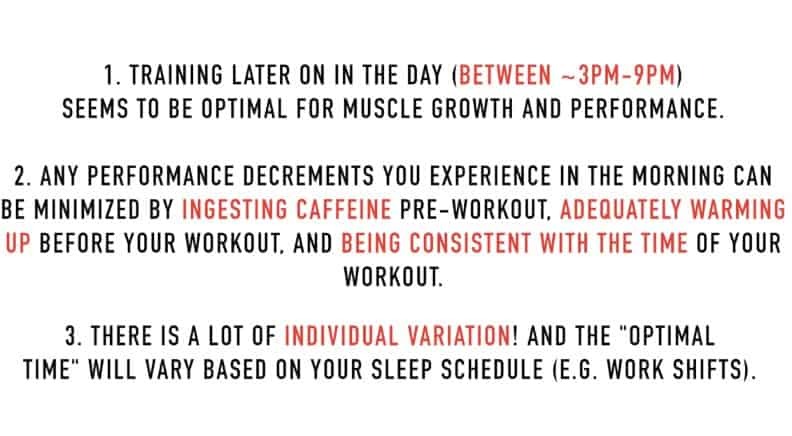 And thus, despite the evening being the optimal time to train for most individuals, with the previously mentioned three tips, you’ll be able to achieve comparable results when training in the morning compared to training later on in the day. Keep in mind though that despite research showing that the evening is the optimal time to train, there is so much individual variation and other factors to consider. For example, although I personally feel that I do perform best in the evening, I consistently workout in the morning since it helps get my day started. And it’s just what I know I’ll be most consistent with. At the end of the day, it’s consistency and adherence to your training program that are the most important factors when it comes to what will deliver you results. So prioritize choosing a time that you enjoy the most, while also keeping what I mentioned in the back of your mind and implementing the various strategies I covered to minimize any performance decrements! That’s it for this article – hope this was interesting and helps you out! Let me know if you have any questions down below and give me a follow on Instagram , Facebook , and Youtube where I’ll be posting informative content on a more regular basis. Hi Jeremy. Thanks a ton for the article, very helpful, as I work from home so wondered when would be the best time to do my daily stuff. I browsed your site and couldnt really find any workout targeted for your abs and core. Do you have something like this? or do you have some post that you recommend ? Not yet! I’ll be coming out with one soon! I am from Bolivia and always appreciate your articles/youtube. Started working out for my fat loss journey a year ago and yoir insights helped me undertand body building. Thanks!